It’s week five of the Scribner Seminar “American Liberty: Our Enduring Struggle over Constitutional Rights,” and Beau Breslin has his freshmen grappling with the concept of the penumbra. They’ve been analyzing the landmark 1965 Supreme Court case Griswold v. Connecticut, regarding the right to privacy. On the board a student draws a simple circle of the sun with rays squiggling off it, and that symbol becomes a tool for understanding a critical concept: that certain rights not specifically spelled out in the Bill of Rights none­theless emanate from the core. Thus the right to privacy, while not expressly enumerated, has been found to exist in the penumbras of rights in Amendments 1, 3, 4, 5, and 9. And from the First Amendment—which includes freedom of speech—emanate “the right to read, to receive and distribute information, the right to inquiry, the right to gain knowledge, to learn, and the one I like: the freedom to teach,” Breslin says. That one is also a favorite of his students, who say his enthusiasm is infectious. “I love the fact Beau is so into the material,” says Matt Rothenberg ’12. “We can tell that he knows it like the back of his hand, but also that he cares deeply about what he’s teaching.” His colleagues can tell that too, and this year they honored him with Skidmore’s Ciancio teaching award. Breslin, an associate professor of government, is teaching the freshman seminar despite his administrative commitments as assistant dean of the faculty and also director of the First-Year Experience. He says he just couldn’t live a semester completely outside the classroom. Over his decade at Skidmore, Breslin has taught on constitutional law, civil liberties, constitutional thought, and capital punishment. His publications include two books, The Communitarian Constitution (2004) and From Words to Worlds: Exploring Constitutional Functionality (2008). He regularly engages his upperclass students in providing research for actual, and often urgent, clemency petitions in death-penalty cases, supporting the pro bono work of attorney John How­ley ’80. 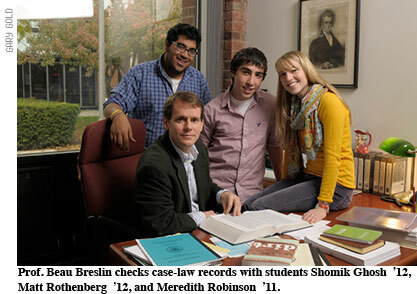 This year Breslin involved his first-year students as well. “My passion for teaching is always what drives me,” says Breslin, who went to college planning to be an art teacher “and fell in love with political science.” He earned his PhD at the University of Pennsylvania and counts it especially fortuitous that the year he entered the job market there was an opening at the alma mater of his mother, Wendy Worseley Breslin ’62. “Skidmore has always been in my blood,” he admits.